OPEC members are discussing a compromise agreement that would see an oil production increase of between 300,000 and 600,000 barrels a day over the next few months, according to people briefed on the talks. While Iran said on Sunday it’s opposed to any increase to current quotas, officials from a number of other countries are optimistic that an agreement can be won for a relatively modest hike at this week’s meeting in Vienna, the people said, asking not to be named discussing private conversations. Brent crude erased losses, gaining as much as 85 cents to US$74.29 a barrel at 9:46 a.m. in London. The compromise output boost, if agreed, would be smaller than the 1.5 million-barrel a day quota increase that Russia has proposed. The prospect of binding Russia, the world’s largest exporter after Saudi Arabia, more closely to OPEC might help persuade Iran and Venezuela, another skeptic about the need for an increase, to back higher production in the second half of the year. After two years of squeezing output to drain a global glut, prices have rallied and inventories are closer to typical levels, sparking debate on the direction of policy in the second half of the year. Russia, under pressure from domestic oil companies keen to develop new fields, has said the total increase should be as much 1.5 million barrels. 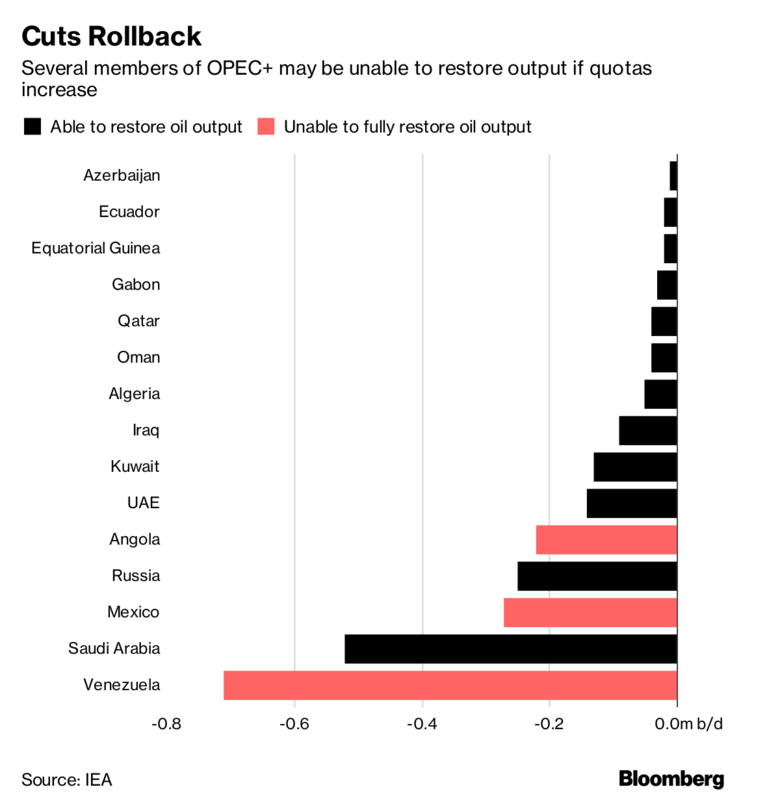 A quota increase of that size shared among all members wouldn’t deliver a commensurate boost in production because several countries, including Venezuela where economic crisis is slowly destroying the oil industry, are unable to raise output. An increase of 300,000 to 600,000 barrels a day -- above the current OPEC+ production of about 32 million barrels a day -- would be a real increase in production from those countries with spare capacity including Saudi Arabia, Russia and the United Arab Emirates. Some OPEC members back increasing output by the lower end of the 300,000 to 600,000 barrel a day range, one of the people said. Saudi Energy Minister Khalid Al-Falih met his Russian counterpart Alexander Novak in Dhahran, Saudi Arabia on Saturday. In comments to Russian media after the talks, Novak said the group would discuss an increase of as much as 1.5 million barrels a day in the third quarter shared "proportionally" among all the countries in the agreement. OPEC is being buffeted by competing geopolitical agendas. While Riyadh and Moscow have agreed to open the taps, Iran and Venezuela want to maintain current policy. Behind the scenes, a Trump administration worried about the impact of rising gas prices on mid-term voters is lobbying hard for a surge in production. The “market is well supplied, and OPEC should abide by its decision up to the end of the year,” Iran’s OPEC representative Hossein Kazempour Ardebili told Bloomberg on Sunday.